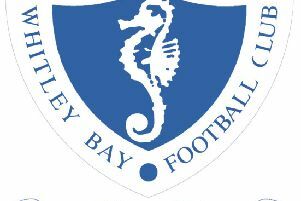 Whitley Bay produced their best performance of the season on a cold and wet Tuesday night with a comprehensive victory over fourth top Newton Aycliffe. After a disappointing few weeks, it was an outstanding team performance with every player contributing and left the fans and manager Ian Chandler delighted and hoping that they can now produce this form on a consistent basis. The visitors started well but Whitley produced the first real chance after nine minutes when Callum Patton’s shot was pushed away by keeper Lewis Brass. Shortly afterwards, Adam Shanks sent a header narrowly wide from Kyle Fryatt’s cross. A speculative lob from distance by Shanks was just too high but then Aycliffe broke to the other end where John Campbell’s cross flew low across goal with Dennis Knight sliding in just too late to make contact with the ball. Whitley took the lead in the 34th minute when Shanks played an excellent ball to the right edge of the Aycliffe area and Andy Robertson cut in and placed his shot across Brass into the far corner of the net. The visitors fought back and when Knight’s shot was pushed wide by Tom Flynn, the corner nearly produced an equaliser but a stinging close range effort brought a great save from the Bay keeper. Aycliffe came out for the second half looking fired up, but the Whitley defence nullified their threat, with Nicky Allen in particular looking impressive in only his second game since returning from injury. Whitley doubled their lead on the hour mark when Fryatt’s ball into the box caused confusion in the Aycliffe defence and Shanks seized on the ball and rifled it into an empty net. Two minutes later it got even better for Whitley when Fryatt provided the perfect cross from the right and Robertson confidently slotted home his second goal of the night. Patton then tried his luck with a 25-yard free kick that was not far off the target, and as Aycliffe’s discipline let them down, they conceded a series of free kicks. They were lucky to keep eleven men on the pitch when a wild tackle brought only a yellow card, but with ten minutes left Knight was dismissed after being cautioned twice in rapid succession. Whitley had opportunities to extend their lead in the closing stages, Fryatt almost setting Robertson up for a hat-trick before Patton’s goalbound effort was deflected high over the bar. In the end it was an impressive and well deserved victory that lifts Whitley up to ninth place in the table, though they have played more games than several teams below them. Whitley Bay: Flynn, Munro (Potter 81), McDonald, Anderson, Wilkinson, Allen, Fryatt, Fowler, Robertson, Patton (Haley 81), Shanks. On Saturday Whitley Bay travel to Marske United then on Tuesday, October 18, Guisborough Town are the visitors to Hillheads for a 7.45pm kick-off.